People have been asking me to translate the C.V that Armando wrote below! Rather than translate it all I will try and give you a flavor of Armando and what he is saying. Armando Teixeira Leão, Mestre Armando is one of the names that helped to write the history of Capoeira Angola, first in Rio and then in Fortaleza Ceara from the 1970s untill now. 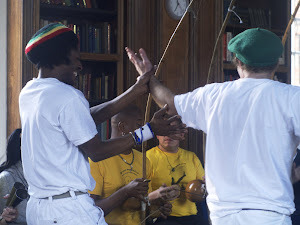 A direct student of Mestre Moraes - Armando started capoeira in 1974 with Mestre Marco Aurelio in Rio and later became a Master under Mestre Moares. He was part of one of the strongest and most significant generation of Angoleiros from Rio. He has had many students in Rio and was well known in all the rodas particularly those involving the black consciousness movement. As a result of Capoeira he became racially aware and a member of the black movement in Brazil. In the 90s he moved to Fortaleza in the state of Ceara and begins a Capoeira Angola group and gets involved in afro-brazilian social movements in defence of black culture. He has worked with lots of NGO's and different movements. From 2001 his group was part of GCAP but then left GCAP in the end in 2008. In Fortaleza he and his group have always been known to be linked to the key social movements and causes particularly those that involve black and African cultural issues. Today he works as an Executive Coordinator for policies of racial equality.